Samurai Warriors for unamarmed combat. There is only one rule and that is "There Are No Rules!" It will teach you to defend yourself using any means necessary. 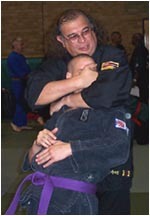 The techniques in Ju Jitsu do not require a lot of strength as they are all based on leverage or using your attackers strength and body movement against them, so it is suitable for both men and women of nearly all ages. 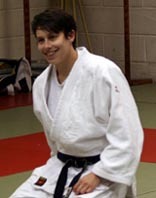 SJJK is run by Sensei Matt Goodall who has over 21 years experience in Martial Arts. Fighting competitivly in Judo at a National Level he started his teaching carreer back in 1990. If you think you may be interested in taking up Ju Jitsu with the SJJK, then please Contact Sensei Matt, who will be pleased to give the information you need as well as answer any questions you may have. Alternatively just turn up on a club night and watch a session for yourself. If you would like to see what Ju Jitsu is all about then you can get your taste buds watering by CLICKING HERE for a list of VIDEO FOOTAGE showing Ju Jitsu in action! Copyright © 2004 SJJK. All rights reserved.